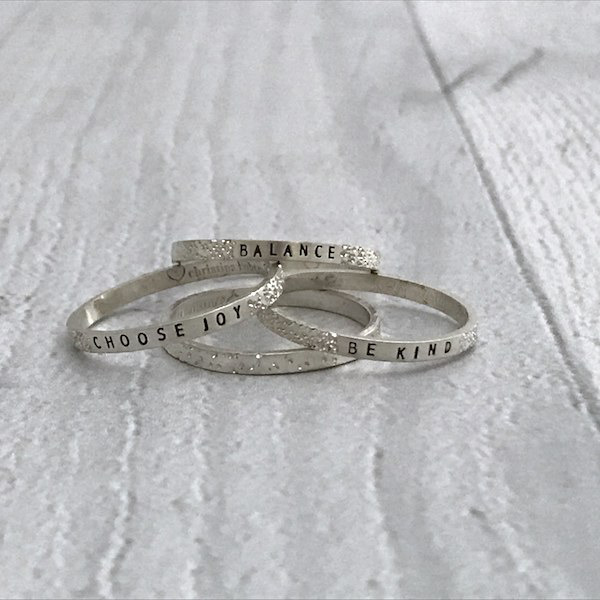 We love the sparkly effect of the Diamond Dusting on these rings! The effect is created by hammering the silver with a diamond to create lots of tiny multi-faceted dents that catch and reflect the light from every angle, a truly dazzling effect. DD: A band with Diamond Dusting all around creating a sparkling everyday ring. 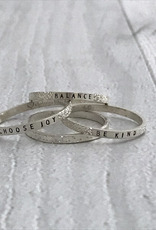 CJ: A Diamond Dusted band with the hand stamped words "CHOOSE JOY"
BAL: A Diamond Dusted band with the hand stamped words "BALANCE"
BK: A Diamond Dusted band with the hand stamped words "BE KIND"
The Narrow Band Ring is approximately 2mm wide and available in sizes 5-9 with or without inspiring words.